Protect Your Home With a Homeowners Warranty - HMS National, Inc.
As a homeowner, you will eventually be faced with the need to repair or replace expensive appliances and home systems such as the A/C, heating unit, washer, dryer or possibly your refrigerator. And when that time comes, a home warranty can save you thousands of dollars. For existing homeowners that would like to purchase a warranty and there is no real estate transaction, please contact us to order. If you're not familiar with home warranties, we'll help you understand what a home warranty is, the appliances and systems that are typically covered and the benefits of a home warranty. Why should buyers and sellers purchase an HMS Home Warranty? 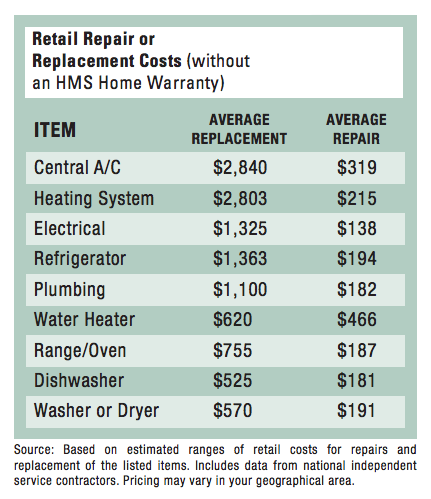 Simply compare the average cost to repair or replace a system or appliance and it's easy to see how you come out ahead. Warranty holders benefit from significant discounts on name-brand appliances through Appliance Buyline and can conveniently place claims and renew their warranty online at any time. With the hefty cost of repairing or replacing major appliances and systems such as air conditioning, heating, plumbing and electrical, an HMS Home Warranty provides the protection and peace of mind you need. * See terms, conditions and limitations in your contract. Non-covered charges may apply to certain repairs or replacements. Warranties may differ by state. For current coverage information for your area, input your zip code to download your brochure. * See terms, conditions and limitations in your contract. Whether you're buying or selling a home, an HMS Home Warranty is an excellent investment. If you're selling a home, the last thing you want to do is shell out big bucks if a system or appliance stops working. And if you're buying a home or you already own your home, it's nice to know you're protected from expensive repair and replacement costs. Whether you are a homebuyer, home seller or existing homeowner you'll appreciate the numerous benefits and conveniences that come from having the HMS Home Warranty. Attract more first-time home buyers. Provide peace of mind for buyers who might be intimidated by the high cost of repairing or replacing systems or appliances. Leverage your HMS Home Warranty. Make your home stand out from other listings. Avoid closing delays. An HMS Home Warranty can minimize the chance that an equipment or system failure could delay closing. Free coverage during listing*. In most states, payment is due at closing. No post-sale worries. If a breakdown happens after closing, the buyer will turn to the HMS Home Warranty. Industry-leading workmanship guarantee. Covered repairs are guaranteed for 180 days. That means you won't pay a cent if the problem reoccurs due to a workmanship issue. Comprehensive protection. We'll repair or replace covered systems and appliances no matter the age, make or model. Plus, there are no home square footage restrictions and no inspection required. National network of pre-screened service partners. Each partner in our network of over 40,000 qualified service professionals has been pre-screened to meet our high service standards. Convenient and easy claims process. We're available 24/7/365. All you have to do to place a claim is call our toll-free number or submit a claim online and you will be assigned a qualified service provider in your area. Never get locked out. You are covered for up to $50 per year for locksmith services. Save with Appliance Buyline®. Even if items in your home are running great, you may decide to remodel or upgrade. You can take advantage of this buying power and get deep discounts off brand name appliances. Industry–leading workmanship guarantee. Covered repairs are guaranteed for 180 days. That means you won't pay a cent if the problem reoccurs due to a workmanship issue. ** See terms, conditions and limitations in your contract. Non-covered charges may apply to certain repairs or replacements. *** Eligibility subject to underwriting criteria. Getting repair service for your home systems and appliances is easy with HMS. Our customer care representatives are available 24 hours a day, 365 days a year, so you never have to wait to place a claim. Click thru the icons to learn more about how it works. Call or submit a claim online. When a covered appliance or system fails, you can request service in the Place My Claim section of My Account anytime, day or night. If you prefer to call, you can also use our automated phone system to place a claim or you can speak to a representative directly. Be sure to have your contract number handy. We will want to know the claim item as well as where it is located in your home. Renewing your home warranty is fast and convenient with our online system. My house was starting to get to the age where things might start breaking down and a friend recommended HMS Home Warranty. My experience submitting a claim was very good. It was a very easy process. The rep seemed friendly and helpful.Their technician was quick and he did a good job. Everything went very well." HMS Home Warranty came with the house when I purchased it. Being able to start the initial request online is very easy and less time consuming. I submitted the form online and the rep called me back to set up an appointment. The contractor verified the time and came out in the allotted schedule. Overall, it was a nice and smooth experience." I have already recommended HMS to a variety of people. I always say you can't be without [a home warranty] and HMS is the best out there for the price." It's been very easy submitting a claim to HMS. I typically do it over the phone and the interaction with the claims rep has been really smooth. Also, the technicians have been great. There's one Sears guy who was having a bad day but he still maintained professionalism for the most part. Everything is still working so they did a good job. They're reliable and accessible. I’ve been happy so far." HMS came out quickly after my husband submitted a claim. The technicians came and did what they promised to do. They were pleasant and explained everything." I have no complaints with the quality of work performed by HMS Home Warranty. I've been a policy holder for 10 years and submitting a claim has been pretty easy. I file it over the phone. I never had any problem with their reps or technicians."